for vienne: Have you heard this crazy story yet? Have you heard this crazy story yet? This story will give you goosebumps. I was set up for a coffee date to meet another local Mama who lost her little girl 12 years ago. The only thing we knew about each other, going into our coffee date, were our girls' coincidentally similar names - Vienne and Vivienne. Little did we know, that that was just the beginning. 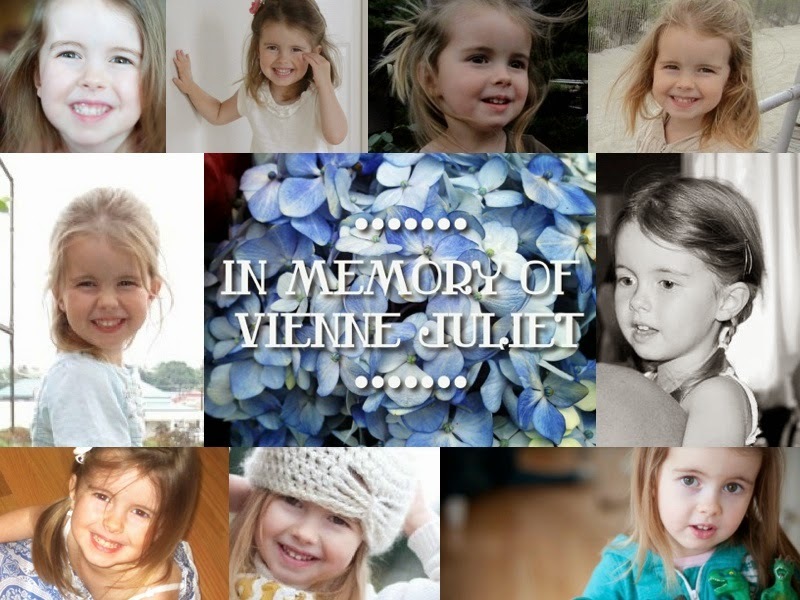 We very quickly learned that both of our precious daughters died from viral myocarditis….on September 6th!!!! Exactly a decade apart…Vivienne died exactly 10 years earlier, on Sept. 6, 2002. Vienne was born on May 1st and Vivienne was born on May 31st… Vienne was 4 1/2 and Vivienne was 2 1/2. It is a crazy coincidental story. We have kept in touch. But, even though it was so similar…what do you do with that? Not much. Just another Mom who suffers as severely as I suffer. Now, even 12 years later, she is still trying to figure herself out…still trying to find peace and joy…still struggling. This was a phenomenal story...such crazy coincidences. I'm glad you have kept in touch with this woman. And you're right...so? What do you do with that? Not much, other than realizing you are not alone and having someone to process your pain with...someone who understands and has been there in such an eerily similar way...that can bring a measure of comfort.